Hanoi (VNA) – With the current rapid growth, revenues from e-commerce retail in Vietnam are likely to reach 15 billion USD in 2020, experts have said. Vietnam’s e-commerce records annual average growth of 35 percent, 2.5 times higher than the figure in Japan, making it one of the countries with the fastest e-commerce growth in the world. Dang Hoang Hai, Director of the E-Commerce and Information Technology Agency under the Ministry of Industry and Trade, said retail sales from e-commerce earned 8 billion USD in 2018, much higher than the forecast figure of 7 billion USD. 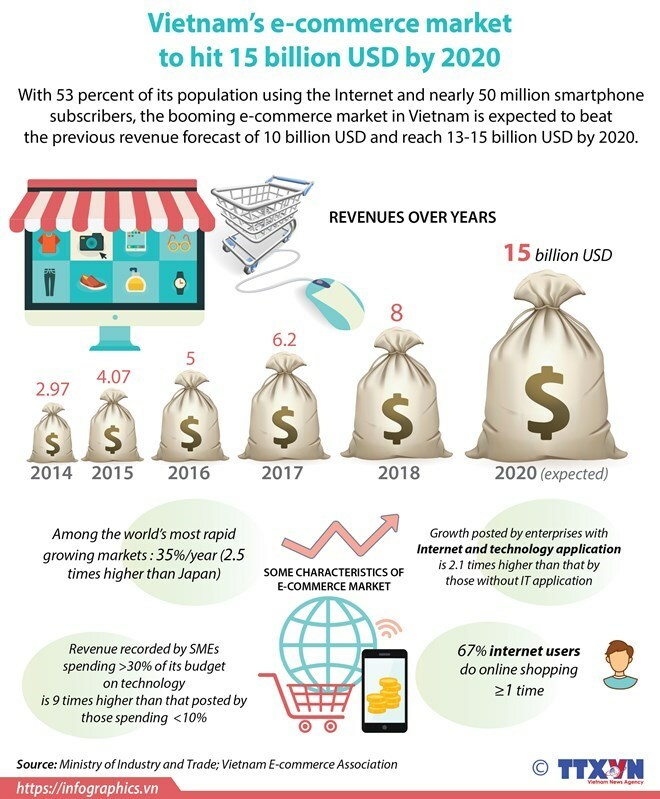 Therefore, revenues from e-commerce in 2020 could surpass beyond the projected number of 10 billion USD, Hai said. A report on online shopping in 2018 conducted by Q&Me market research service provider showed that Shopee accounts for the lion’s share, at 35 percent, of the domestic e-commerce market, with over 700 active brands and sellers. Meanwhile, Le Anh Huy, Deputy General Director of Sen Do Technology JSC - the operator of Sendo online commerce platform - said in 2018, Sendo recorded a threefold surge over the previous year, serving more than 10 million consumers across the country. However, the experts said that e-commerce in Vietnam still faces various obstacles, including legal issues, skills for e-commerce development, security rights of concerned parties, and infrastructure for the sector. In addition, support for e-commerce development in Vietnam’s remote and mountainous regions remains modest. According to the experts, Vietnam should consider the establishment of a state management agency to tackle those challenges and bolster the development of logistics in line with the digital economy, or assign the tasks to a ministry.